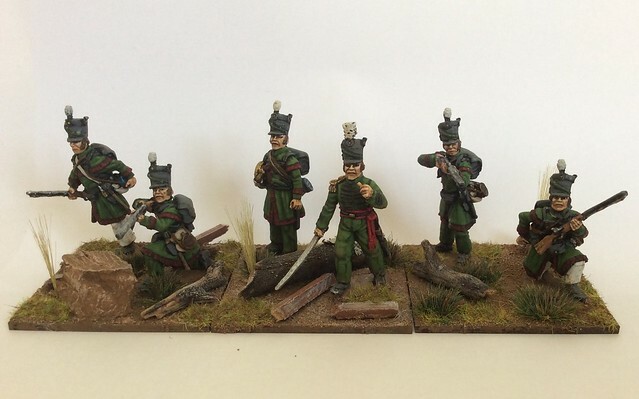 Which shade of green do you use for War of 1812 US riflemen? The online guides seem to show quite a bright shade of green. Is there a contemporary European unit that you could compare it to? I've used foundry French dragoon green. For any uniform before the advent of so-called "color fast dyes", which aren't really, my rule of thumb is usually "the green bottle within reach". You would not be wrong to use several different shades. And speaking of "color fast dyes", I supervised color approval of dye lots received from automotive textile manufacturers back in the early days of this century. Some matches to Masters were … iffy. Did you ever see automotive carpeting that has been covered with rubber floor mats? Or the fade on a rear deck, exposed to the sun? And I'm talking about strict manufacturing controls, with certified QS9000 masters controlling the hue. These controls did not exist in 1812, let alone 1776. I think the online guides are wrong. I don't have the reference to hand, but I seem to recall that H.C. McBarron said the winter wool uniform was supposed to be bottle green, which would be a very dark green (like the green of a wine bottle). The summer hunting shirt may have been more of an olive drab color.